Boulder City Review staff members came home with five awards from the Nevada Press Association’s 2016 Better Newspaper Contest. 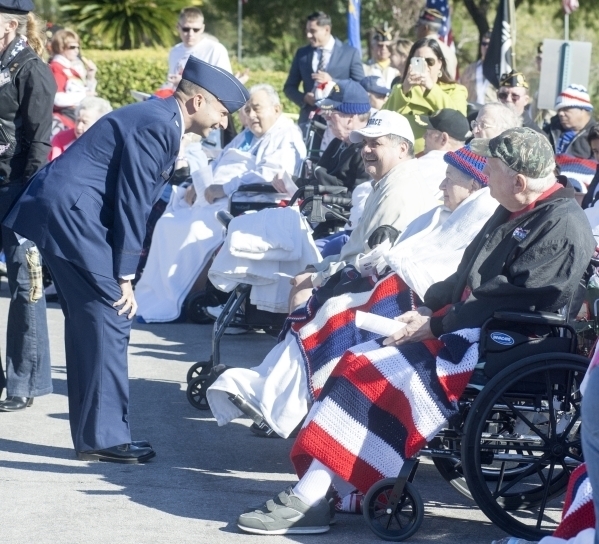 File photo This photo by Steve Andrascik, taken during Veterans Day ceremonies at the Nevada State Veterans Home in Boulder City, won second place for best news photo in the 2016 Better Newspaper Contest sponsored by the Nevada Press Association. In all, the paper netted one first-place, two second-place and two third-place awards. Editor Hali Bernstein Saylor won a second-place award for best headline writing and a third-place award for her column. Photographers Steve Andrascik and Laura Hubel won second- and third-place awards, respectively, for their efforts. Andrascik’s award in the best news photo category came from a photo taken during the Veterans Day celebration at the Nevada State Veterans Home. “You caught a touching moment,” remarked the judges. Hubel’s award in the best sports photo category was for a baseball photo. “Great action shot that leaves the audience wondering if the catcher actually stuck the landing, or fell flat on the runner,” wrote the judges.